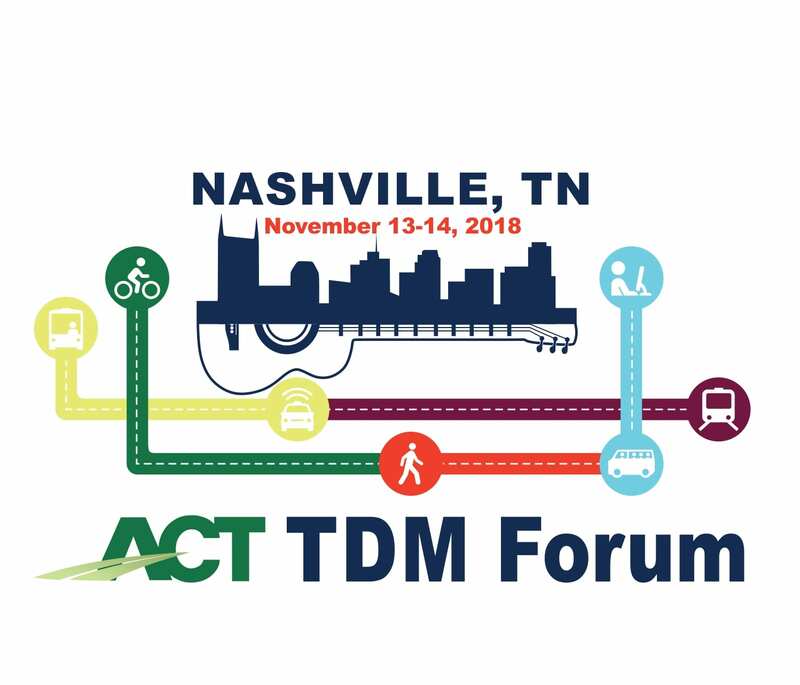 Nashville plays host this week to the annual Transportation Demand Management Forum, where the Association of Commuter Transportation brings experts together to explore strategies to keep everyone happy and mobile. While managing fantastic growth, the Music City is doing it’s best NOT TO CLIMB any higher on the list of the nation’s top 25 worst traffic where the city hopes to fall back down the ladder when it comes to traffic congestion. Contributing to that goal is a new TDM solution called Hytch Rewards, born in Music City. When the company launched this year with big partners like Nissan, Sprint, and Goodwill; this small southern startup proved it could deliver Silicon-Valley-sized ideas. Hytch Rewards is a multimodal mobility incentive platform, expressed as a mobile phone app and used by businesses, universities and government agencies to get people motivated to share. The goal is to document and rewards environmentally smart behaviors and incentivize commuters to change behavior. A key difference between Hytch and other classic “TDM solutions” in the industry is our focus on connecting people to drive demand, while most TDM solutions focus on increasing the “supply” of more transportation options. Some argue that there is an oversupply of transportation (e.g. the drive alone car, or the empty transit bus) and that demand is decreasing. Hytch aims to drive the cultural change that can drive commuters to “off peak” ride times, or even create a demand by rewarding ridership. Commuters anywhere in the USA can record their shared ride with the Hytch app and enjoy a ZERO EMISSION mile. In Tennessee and other states, you can earn a penny or more per mile as a bonus in sponsored areas. Igniting the test market in Tennessee, Nissan helped capture the imagination of thousands of daily commuters. 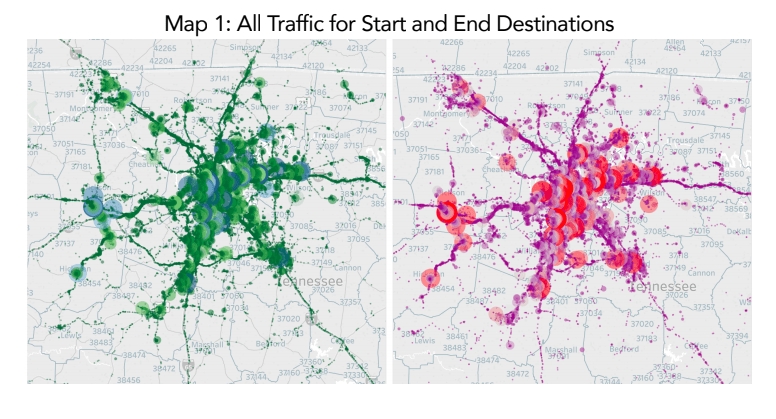 Experiments with variable cash incentives offered the data driven demand management proof that helped the partner drive a usage pattern and encourage users to share rides during peak times. The resulting map below offers evidence of regional demand impacts. Hytch riders have prevented 2,726 carbon tonnes from entering the atmosphere because users made the conscious choice to share rides instead of drive alone in a vehicle by themselves. “It’s a great service.. me and my husband use it everywhere we go. We’ve even managed to get our friends to start Hytching and now we send them invites from the app to let them know when we’re almost there and ready to pick them up. Why would you not use it? - Charlie F.
Lipscomb, like many other universities, is fighting a losing battle when it comes to parking demand. Any institution can spend $35,000 per parking spot to store your car, but Lipscomb is interested in a more creative, service oriented solution. What can we do to reward people who place a lower demand on parking? The university now offers students and staff a reward for sharing rides to campus, paying even more for parking off campus in less expensive lots and taking shuttles to class. Dedicated, Hytch branded parking in premium spots is a big bonus! RETAIL: H.G. Hill Pays Tenant Employees to Self Organize and Share Rides, Preserving Parking Capacity for Customers. Businesses with brick and mortar locations survive on destination traffic. H.G. Hill is a market leading real estate development company that immediately recognized the competitive advantage Hytch Rewards can create. Their reward strategy put an incentive on every decision a tenant’s employee might make to carpool, leaving more spots for paying customers, who can also earn rewards when they share a ride to their favorite stores. The chart below shows increasingly dark blue cells to indicate higher volumes of Hytch Rewards users arriving at H.G. Hill locations during peak commute hours, leaving more parking spaces for customers. 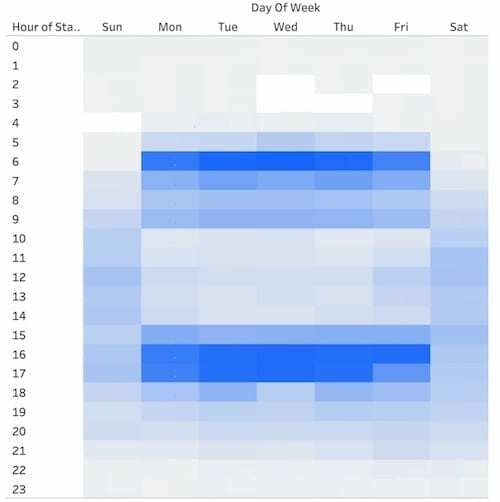 You can see the 2 separate shifts that employees show up in the concentrated hours of 6am and again 5pm and 6pm. “I have been carpooling with the same group of coworkers for years. Ever since we found out HG Hill is paying for us to share rides to work, we’ve practically become religious about it. It just makes sense.. Get it? Makes cents. You get it.” - Kate C.
Anyone who understands Transportation Demand Management knows that there is a lot more to changing behavior than simply offering more options. The reward engine Hytch created can help any creative organization incentivize commuters to self-organize behind that company’s TDM goals. If you’d like to know more about how you could be using Hytch for your own TDM initiatives, contact our business development team here and set up an appointment for a free consultation.